If you are a rice lover, that's one thing; however, if you are a stir fried rice lover, this recipe creation propels this grain to a whole new level. And if you follow the preparation to a tee, this dish will take your taste buds to what they may consider taste bud heaven! Let's face it, things don't get much better to the palate than a dish of fried rice when prepared to perfection and the Chinese have been one of the Masters of this dish since time began. And then along comes this cocky Frenchman (yours truly) who dares step into their culinary territory and try his hand at perfecting something that has already reached its pinnacle. Mais pourquoi, one might ask, would anyone dare stick his or her neck out and try to beat the Champions at their best game? It is perhaps because he loves the challenge. This creation of a stir fried rice has now been tested by a handful of people and their verdict has been two thumbs up so far. So now you be the judge and jury. Prepare it and see for yourself. Is it worthy of a place at your table? Precook your rice. Follow the directions on the package, bringing the water to a boil in a medium pot. Then add the oil and the salt. Rinse the rice well, drain, and add to the pot. Cover and reduce heat to low and simmer for 45 to 50 minutes. You can use 1/4 cup less water if you cook for 45 minutes and want your rice a bit firmer. IF you can't find the brown jasmine rice, the traditional white should work fine; however, remember, this dish was prepared with the brown. While rice is cooking, prepare all the other ingredients. Please note: wait until the final step to add the salt and pepper so that you can taste and judge now much you want. Some people like more salt and others less. In a medium glass, add the 1/4 cup of hot water, Mirin, Hoisan sauce, and oyster sauce together and stir until well diluted, set aside. Prepare all your vegetables per the preparation above, chopping and dicing, etc. Place the Edamame beans in a microwavable dish, along with 2 tablespoons of water. Cover tightly, and microwave on high for about 3 minutes and 30 seconds. Set aside and uncover after a minute. Most of the podded Edamame will come frozen, for your information, and it can be found in the frozen vegetable section of your grocery store. In a large (10 inch) fry pan (or wok, if you have one), add half of the vegetable oil and heat on high, but don't allow the oil to start smoking. Once the oil is hot, add the diced red bell peppers and saute while stirring for about 90 seconds. Next, add the garlic, ginger, and shallots and continue stirring for another 90 seconds. Reduce the heat to medium high and add the cabbage. Toss and stir so that all ingredients are well mixed together and continue to saute for another 2 minutes. You may, at this time, add 5 shakes of the salt shaker and the ground pepper. Stir, then remove from the pan into a bowl. Make sure the pan has been scraped with a metal spatula, then add half of the remaining vegetable oil, and quickly saute the 2 beaten eggs over medium high heat. Don't overcook the eggs, Chop and stir with your spatula for about 45 seconds and remove eggs into a small bowl. Again, scrape the bottom of the pan well, then add the rest of the vegetable oil and the sesame oil into the pan and heat at medium high heat. When oil is nice and hot, it will easily coat the bottom of the pan when you swirl the pan around. Now, add your cooked rice to the pan and stir, scraping the bottom frequently as you stir. Fry the rice for about 2 minutes. Next, add the sauteed vegetables to the rice and stir so that all ingredients are very well mixed. Add the Edamame beans and continue to saute for another minute. Add the liquid mixture you had set aside and stir until all ingredients are well coated. Finally, add the cooked eggs and do a final stir so they are well distributed throughout the dish. Give yourself one last taste for flavor and add a bit more salt and pepper if needed. 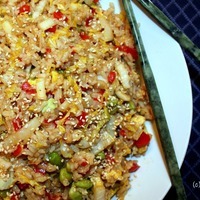 Transfer the fried rice to a heated large serving bowl and sprinkle the sesame seeds over the top. Serve hot all by itself or with your favorite meat. This preparation will yield 6 servings if accompanied by a second item or about 5, if served by itself. Enjoy your creation and please feel free to critique it as you seem fit. Very tasty and comforting. Loved it. This is my kind of comfort food. I will your recipe soon. You may want to try my rice recipe which is similar to this one called Katiuska's Flavoured rice. Yum! Thanks for sharing. Thank you for the compliment. Much appreciated. This was delicious and you should definitely try it. I will also check your rice dish as well. I love rice and it's always nice to try what others do with it. Thanks again. So colorful, and the flavor combos have me salivating! A must-try-soon!